Holy moly… Apple AirPods are actually back in stock on Amazon right now with free Prime shipping! But wait, before you order yourself a pair of $159 earbuds from Apple, there’s another option you might want to consider. The SmartOmi Q5 Truly Wireless Earbuds are the best-selling cord-free headphones we’ve ever covered, and we’ve received a ton of great feedback from our readers. In fact, many people out there tell us that they sound even better than AirPods. It’s not because they have higher quality speakers though, it’s because they have silicon tips that actually stay in your ears and isolate sound. AirPods are made out of slippery plastic instead, so they never stay in your ears properly. 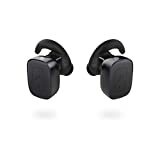 Use the coupon code 50SDPHDM on Amazon today and you can snag a pair of SmartOmi Q5 earbuds for just $19.99. Then you’ll see for yourself how good they are for ultra-affordable headphones.